Around 30 guests from across the globe and 120 shop stewards from the National Union of Metalworkers of South Africa (NUMSA) met from August 7-10 in Johannesburg to discuss the prospects and challenges of building a new, left political alternative to the ruling African National Congress (ANC), the party of now deceased national hero Nelson Mandela. This call by the country’s largest trade union, with over 300,000 members, has caused reverberations throughout the working class as a whole, and has led some in the media to describe the process as “likely to lead to the birth of a workers‘ party that will eventually challenge [the ANC] for power”. NUMSA’s challenge to the established status quo has also highlighted the many dangers and challenges they face, perhaps most graphically illustrated by the murder of three of its shop stewards on the eve of the symposium. That NUMSA’s call has received so much attention can be explained by the reality of South African society, twenty years after the fall of apartheid. When the ANC was swept into power in 1994, under South Africa’s first elections in which all citizens were allowed to vote, it did so as the party that had successfully led South Africa’s “democratic revolution” against apartheid. Since then, the Charter has served to bind together the component parts of the Tripartite Alliance: the ANC, the South African Communist Party (SACP) and the Congress of South African Trade Unions (COSATU). However, after twenty years of ANC rule, South Africa continues to remain a long way away from the vision set out in the Freedom Charter. Instead of completing the “democratic revolution”, the ANC has in fact presided over dual transition processes, neither of which it was has been able to successfully complete. On the one hand was the transition towards a post-apartheid political democracy. While important strides have been taken in dismantling the old system of segregation, NUMSA General Secretary Irvin Jim noted that much still remains to be done. In his presentation to the symposium, Jim listed a litany of ways in which South Africa has actually moved further away from the original vision of the Freedom Charter. For example, he said that far from sharing the country’s wealth, the ANC rules over a South Africa that is more unequal today than it was in 1994. Similarly, life expectancy dropped from 62 years of age in 1992 to 58 in 2012, with the gap between blacks and whites still an astonishing difference of 23 years (48 years compared to 71 years, respectively). Jim also pointed to figures that indicate that white employees continue to earn on average four times more than African employees. The failure to achieve the aims of the ‘democratic revolution’, in large part can be explained by the fact that the ANC’s coming to power coincided with the peak moment in neoliberalism’s global supremacy. Rather than challenge neoliberalism, South Africa’s new rulers preferred to acquiesce to the international terms imposed by big business and institutions such as the International Monetary Fund. While the Freedom Charter proposed nationalizing the mines and banks, the ANC instead further entrenched the economy’s dependency on mineral exports, while facilitating the rise of a powerful financial sector. At the same time, the manufacturing sector suffered a steep process of de-industrialisation. The result, Jim explained, was that more than 620,000 manufacturing jobs were lost between 1995-2008, and in 2009 alone, 1 million jobs were lost across the economy. Yet, the ANC was never able to inflict the kinds of defeat on the working class that had accompanied the implementation of neoliberalism globally. Instead, strike levels remain relatively constant throughout the nineties, and rose dramatically from 2005 onwards, reaching levels that surpass that of any other country in the world. Moreover, the rise in worker militancy was paralleled by a surge in community protests, mainly over access to basic services and unemployment. As a result, South Africa today has the highest rate of protests per capita of any country, and been dubbed by some the “protest capital of the world”. This tension between, on the one hand, a growing nexus between mining and financial economic elites and the new ANC state managers, and on the other, rising discontent from below, ultimately exploded with the tragic events at Marikana. On August 16, 2012, state security forces gunned down 34 workers from a local platinum mine operation run by Lonmin, in an attempt to end the month-long strike. Subsequent investigations into the events at Marikana revealed a high level of collusion between company executives and state officials in perpetrating the massacre. Police stand over the bodies of murdered strikers. For many, Marikana seemed to bring into sharp relief everything that was wrong with post-apartheid South Africa. Despite the immense wealth being extracted out of the country’s platinum belt, responsible for 80 percent of the world’s supply of the precious metal, workers continued to labor in deadly conditions for extremely low wages. When workers decided to fight back, they not only had to confront the company, but also its backers in the ANC government. This included figures such as Cyril Ramaphosa, a former mineworkers union leader who became the deputy president of the country and sits on the board of Lonmin. Despite the tragic events of August 16, workers maintained their strike for another month and ultimately won a 22% pay rise. 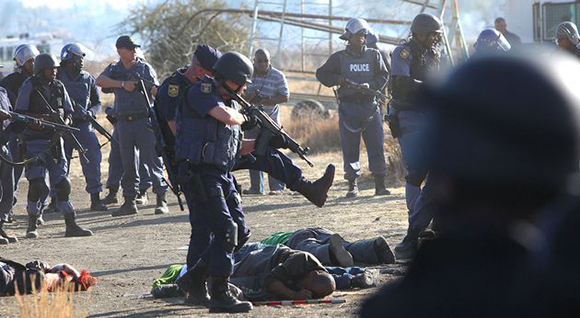 Moreover, the events at Marikana triggered off a new wave of strikes across various sectors. The following year saw South Africa register its highest level of strike incidents yet (more than half of which involved unprotected actions), while 2014 has already seen a five-month long strike involving 70,000 workers in the platinum belt and a month-long strike by 220,000 NUMSA members. All this has contributed to a rising sentiment among activists that conditions exist for building a left wing, working class alternative to the ANC. Faced with this situation, NUMSA convened its 2013 SNC to decide how best to respond. Delegates to the congress decided NUMSA should establish a “United Front” that could coordinate struggles in the workplace and communities, while retaking up the fight to implement the Freedom Charter. They also resolved to call on COSATU to break from the Tripartite Alliance. The international symposium brought together 28 party activists, trade unionists and social movement activists from 17 countries. Among those present were representatives from the Movement Towards Socialism (Bolivia), PAIS Alliance (Ecuador), Movement of Landless Rural Workers (Brazil), Syriza (Greece), The Left (Germany), Korean Metal Workers Union, Labour Party (Nigeria), Broad Front (Uruguay), Party of the Laboring Masses (Philippines), and the Egyptian Socialist Party. Discussion ranged across a variety of issues including what attitude any new party should take towards elections and government (especially in light of the ANC and SACP’s trajectory), how it should go about “raising consciousness”, and which classes and social forces should the party include in its ranks. Another issue had to do with the role of trade unions in politics. The general consensus, certainly among NUMSA leaders, was that the NUMSA would always be a trade union, acting as a “shield and spear” in the hands of workers. Nevertheless, this was not counter-posed to playing the role of “catalyst” for a new party. What was apparent throughout the three days was the enthusiasm and seriousness with which NUMSA leaders and members alike had taken up this discussion. Also apparent are the serious challenges and obstacles they will face. The murder of three NUMSA shop stewards the day prior to the symposium is one example. While the exact circumstances behind the murders have not been fully clarified, NUMSA leaders and members were in no doubt that it was part of a concerted campaign against the dissident trade union. They also believe this is connected to an attempt by forces, most notably the SACP, to form a new, pro-ANC trade union in the metalworkers sector with the intention of challenging NUMSA for members. Another challenge will be dealing with the disputes that have emerged within COSATU, particularly over NUMSA’s push for a special congress to discuss the confederation’s alliance with the ANC. This has led to talk of expelling NUMSA, COSATU’s largest affiliate. NUMSA is not only facing the challenges posed by those forces opposed to its initiatives; but also of how to relate to potential allies. 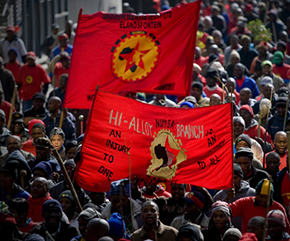 At the most immediate level is the question of NUMSA’s relationship with COSATU’s rival, the National Council of Trade Unions, and especially its largest affiliate, the Association of Mineworkers and Construction Union, which played a key role in the Marikana dispute and subsequent strikes in the platinum belt. Through this process, AMCU has become the biggest union in the platinum mining sector, and is seen by many as a powerful symbol of resistance to the ANC government. Any attempts at unity are sure to stoke tensions with COSATU. 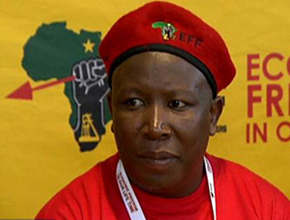 Julius Malema, a leader of EFF. Then there is the issue of the Economic Freedom Fighters (EFF), a new political force established by former ANC youth leaders who were expelled from the party. Although invited to attend the symposium, the EFF declined to participate. Set up just one year before the May 2014 elections, the EFF went on to become the third largest political force in the country (winning 6.4% of the vote) on a platform focused on nationalizing the mines and banks, and opposition to ANC corruption. Most of the EFF’s support came from disenchanted youth and workers, particular in the platinum belt, where party leader Julius Malema campaigned heavily both during the Marikana dispute and then the election campaign. Perhaps the biggest challenge however, will be how any new party seeks to involve the ever-increasing numbers of grassroots workplace and community activists, and even broader sectors of society, who while fed up with the ANC, have yet to find a political home. Without a doubt, the ANC continues to loom large in South African politics, in no small part because of its historic legacy as the party that defeated apartheid. Yet, increasing numbers are questioning whether the party remains a useful vehicle for advancing change. That is why despite winning the 2014 elections with 62% of the vote, some within the ruling party are deeply concerned by the fact that its share of support in terms of the overall voting population (which includes those that abstained or did not bother to register) has consistently fallen at every election, from 54% in 1994 to 35% this time around. NUMSA therefore faces the challenge of uniting with grassroots worker and community leaders, as a vital stepping-stone to tapping into the broader social discontent present in South African society. This is in a context where an unequal relationship exists between a large, organized trade union and small, disparate local community groups. Moreover, any new party will have to deal with the existence of different left tendencies, each with their own particular ideology and discourse that, in many cases, reflect difference experiences and practice. Today NUMSA is at the heart of an emerging process of left re-composition. NUMSA’s ability to navigate through this difficult terrain will play an important role in determining whether the new liberation forces that have emerged in South Africa are capable of transforming the existing social discontent into a political force for lasting change. Federico Fuentes is co-author of Latin America Turbulent Transitions: The Future of Twenty-First Century Socialism and editor of Bolivia Rising. This article was originally published by TeleSUR English.